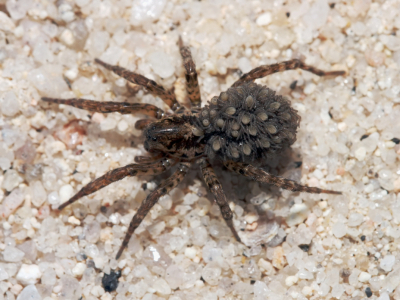 With 125 different species, the wolf spider is a very common property pest around the United States. They are called wolf spiders not because of their large, hairy, wolf-like appearance; but because they were once believed to hunt in packs like wolves. These spiders do not make webs, but live in burrows hunting their prey on the ground. Wolf spiders enter homes during the cooler months, looking for food and refuge from the elements. You’ll see them scurry across your beautiful marble tiling, both day and night, as they search for their next meal. They are usually brown in color, can grow to reach well over an inch in length, and they have a Union Jack (British flag) impression on their backs. Wolf spiders are venomous, and poisonous. Although menacing in appearance, wolf spiders don’t generally bite unless they are threatened or provoked. While wolf spiders are poisonous, their bites are usually not fatal to humans. If you are bitten by a wolf spider, you will likely experience moderate symptoms like swelling, redness, and mild pain. If bitten, make sure to wash the bite thoroughly with warm soapy water, and apply an antiseptic to prevent infection. If symptoms worsen, seek medical attention immediately as it may indicate you are having an allergic reaction to the spider’s venom. Wolf spiders should not be treated lightly even if their venom is not lethal. Their bites can be painful, and may cause health concernsâ€¦ Not to mention they are an eyesore! Professional spider control may be needed to eliminate wolf spiders form homes or properties.